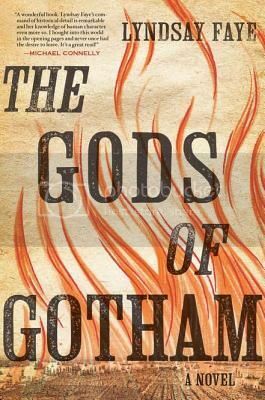 It is no secret that I loved Lyndsay Faye’s The Gods of Gotham. Not only did I give it a rave review, but it was one of my two picks of the month for March. I’m not the only one who is loving it, though. We discussed The Gods of Gotham for our recent BOOK CLUB, and the praise was universal – great if you are looking for something that will finally satisfy everyone! There’s a lot to talk about in The Gods of Gotham, too, even if the lack of dissension makes for a little less back and forth. Even NPR’S Maureen Corrigan is piling on the love, calling The Gods of Gotham “one of the worthiest successors yet” to The Alienist, Caleb Carr’s best-selling crime novel of old New York. I’m thrilled to say that today I can offer a signed, personalized hardcover copy to one lucky reader with a US or Canadian mailing address (no PO boxes, please). All you have to do is fill out the form below by 11:59 am Central on Monday, April 16th, and you will be entered to win a copy of your very own.